The Book of Haggai was written around 520 BC, and it was a message from God to His people through the prophet. Twice in seven verses of chapter 1 God says, “Consider your ways.” The first time God uses this phrase comes in a response to the people saying that it’s not the right time to rebuild the temple. God’s people were facing opposition and experienced a lack of economic prosperity. Their focus was not on the building of the temple, but only on themselves. Haggai paints a picture of the economy with small harvests, lack of wine, no money for clothing, and wages placed in purses with holes only to fall out (Haggai 1:7–11). There would be no rain to produce crops and hardships would be on men, cattle, and their labour all because their focus was not on obedience to the Lord. God says, “Consider your ways…build so I may be glorified.” There’s no doubt that obedience brings blessing—but they had to build. Do you ever have that loss of focus? Looking around at our country, I’m seeing the economic struggles families now face: higher costs of living and the constant battle of pressing down the inner desire to build material wealth. “Take courage,” declares the Lord, “and work; for I am with you” (Haggai 2:4). God promises His people His Spirit is abiding in their midst, so they have no need to fear. He also promises prosperity as He will shake the heavens and the earth, the sea, the dry land. He will shake the nations and they will come with their wealth. God will fill the house with glory. He tells us the silver and gold are His. These are wonderful promises from our mighty God. God will take care of the opposition. God will provide the resources—but our responsibility is to build. It’s truth for today, isn’t it? We’re not building anything physical—no bricks and mortar—but we’re building a church: the body of Christ. Our call to obedience is to build, and to make disciples of all nations. Here’s what Peter tells us about building for the glory of the Lord: “And coming to Him as to a living stone which has been rejected by men, but is choice and precious in the sight of God, you also, as living stones, are being built up as a spiritual house for a holy priesthood, to offer up spiritual sacrifices acceptable to God through Jesus Christ” (1 Peter 2:4–5). We’re built on the cornerstone who is Jesus. We’re a chosen race, a royal priesthood, a Holy Nation a people for God’s possession, so that we might proclaim Him. September has arrived, classes are starting up, and leaders will begin to pour all their energies into discipling their students for the glory of God. We must pray for them as they lead. Opposition will come, but our leaders must remember to take courage, for the Lord is with them. 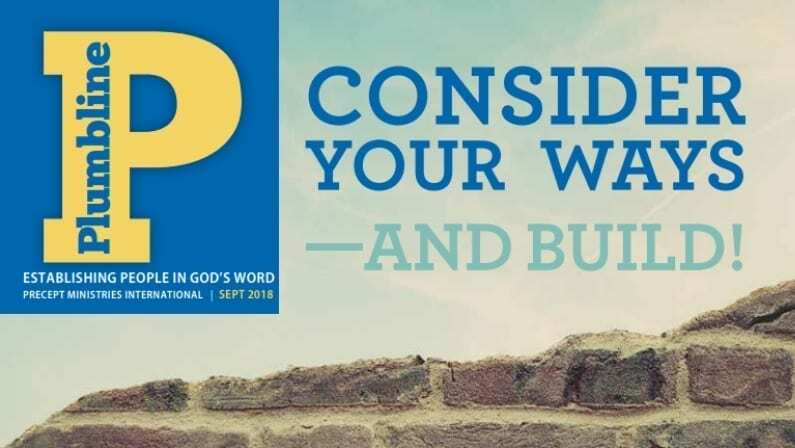 We’re called to build, and I invite you to join us in our building project. God has called us to establish people in God’s Word through inductive Bible study training workshops, study resources, and weekly classes. Consider joining us as we further the kingdom of God in Canada! Join our E-Team and become a monthly financial and prayer partner. Give a one-time gift to partner in developing more leaders through our Entrust Discipleship Program. Start a new Bible study class. Contact us to find out how.